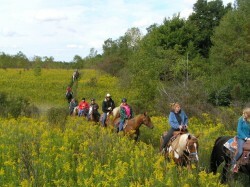 Just as there are many issues that arise to threaten the equestrian way of life and access to equine land, facilities and trails, there are just as many opportunities to partner with local and state level government agencies, conservancies, land trusts and other organizations to work toward resolving land and trail issues in your local community and have a positive outcome. It’s up to local equine community members to take the steps required to have your voices heard and to protect the places and spaces that serve the need for equine activities and horse-keeping. Read full article about best practices for equine land advocacy here.